After a four-day negotiation, today thirty-four British trade unions reach a formal agreement with the Ministry of Treasury to suspend practices and customs that have held back production increases in war material, especially munitions. 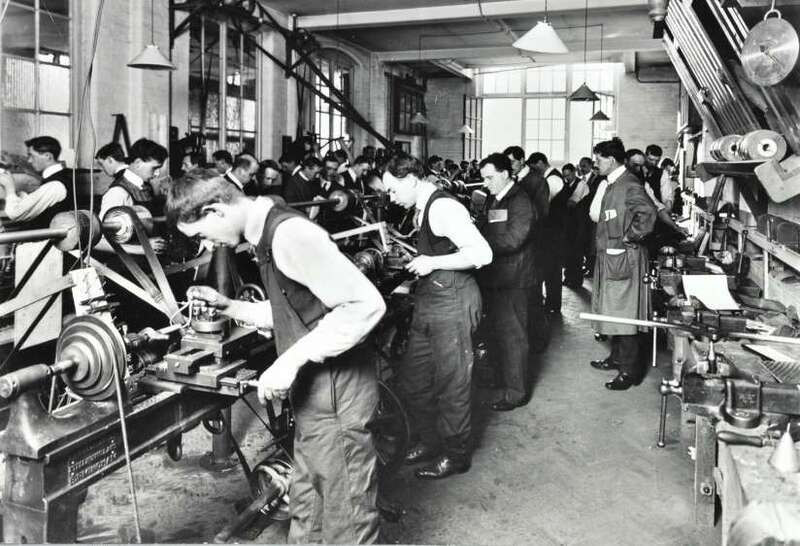 Nearly a quarter of the prewar workforce in ammunition factories is now either on the front lines or in the reserves, and despite expanded training programs like the one at Shoreditch in the photograph above, the shortage of skilled and even unskilled labor is still holding back efforts to increase output. 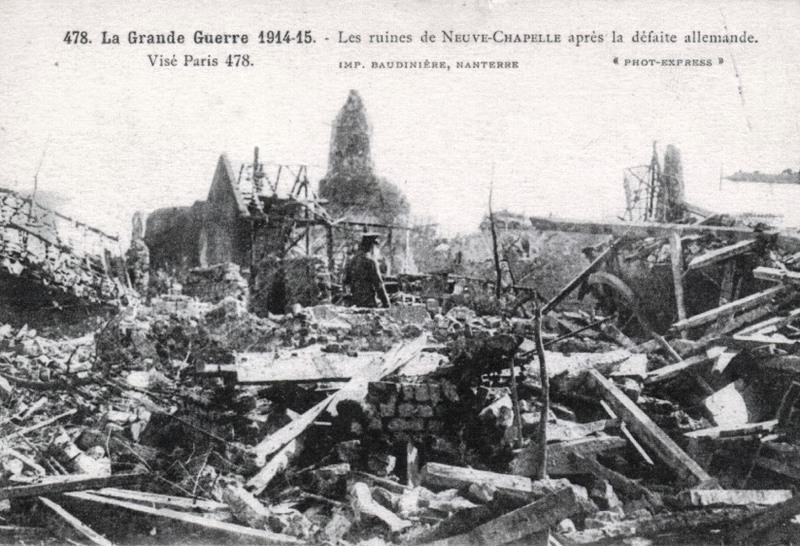 Simply doubling or tripling the number of shells will not be enough: production must increase a hundred times over just to meet the attrition rates of the Western Front, and the shortfall is already costing tens of thousands of lives on the battlefield as artillery batteries run out of ammunition to support the infantry on both offense and defense. But the problem also extends to factories making canvas bags, rubber works, and even carpentry shops, for the war places increased demand on all sorts of industries, even when there is no slack left in the labor pool. Unemployment is not a problem in most of the British nation with a significant fraction of its most productive men at war. The new rules for munitions plants are meant to be temporary, just as the war was meant to be temporary. The unions give up their rights and conditions, especially their right to strike and lock out management, for the duration of the conflict. Compulsory arbitration will settle all disputes. Employers are allowed to bring new, unskilled workers into union shops to take positions that are normally skilled — ‘dilution’ — challenging safety and quality control. More disturbing to social and political conservatives, however, is the looming prospect of hundreds of thousands of women prepared to enter the workforce. 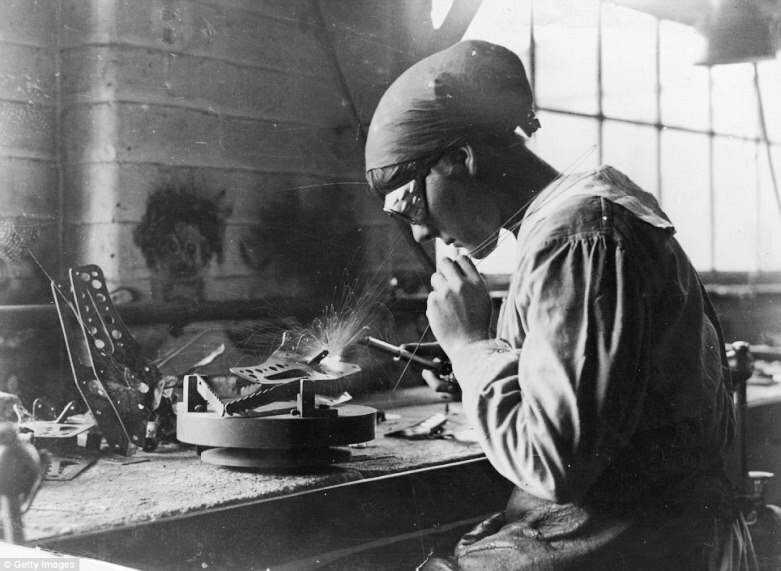 In May, Chancellor of the Exchequer Lloyd George will move from the Treasury to the new Ministry of Munitions; in June, he will conclude an agreement with the Trade Unions Congress that admits British women into the workaday world. Even at lesser wages, they will never look back. It is the end of the Edwardian era, and women cast aside their resource-intensive corsets for brassieres out of national need. The perennial cry of the bourgeoisie — “why is it so hard to find good help?” — takes on greater currency than ever before during 1915 as women leave domestic service in droves to lay asphalt, drive ambulances, keep records, sell clothing, make boots, and yes, build weapons. 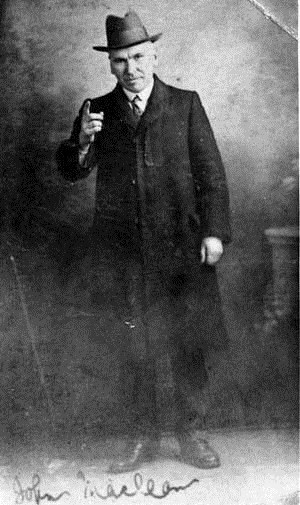 Yet progress always involves compromise and disappointment: the principle of paying women less for equally difficult, equally dangerous work is firmly established by George’s compromise with the trade unions, and has yet to be fully erased in Britain even today. The munition workers’ unions press for skilled men at the front to be recalled before resorting to such measures as admitting women, but this proves impractical. Instead, at the conclusion of the war, the new male and female workers who have entered the union shops during the nation’s hour of need may be laid off for those union brothers returning from the colors. It is important to note that, just as the spirit of volunteerism in Britain is matched by an anxiety over the eventual necessity of military conscription, the peoples of Great Britain face the possibility of industrial conscription — the nationalization of labor markets for the war effort. Tomorrow, the National Advisory Committee tackles this threat by proposing that commercial workmen be allowed to voluntarily transfer between shops as needed instead of taking coercive measures to draft labor from commercial employers to put them in government jobs. As a result, on May 15th, the North-East Coast Armaments Committee launches a ‘King’s Squad’ of 5,200 men, 1,300 of whom have already been accepted by their new employers. The model is deemed a success and replicated across the country. Like Lord Kitchener, the Minister of War whose poor management of shell production has created a crisis on the battlefield, Lloyd George soon has an army at his command. The national unions may have decided on patriotic sacrifices, but not everyone is happy with the new arrangement. 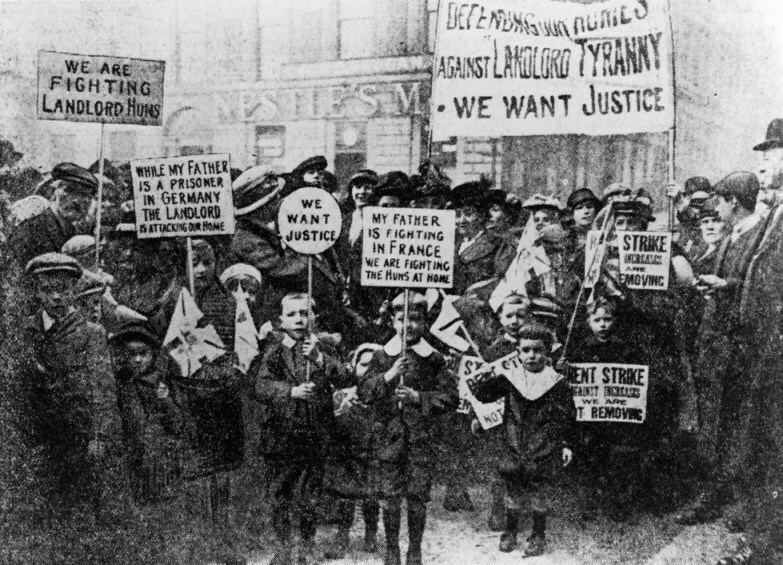 The syndicalists and internationalists among the British labor movement are radically opposed to George’s expansion of government, for they oppose the Great War, denouncing it as a conflict between decadent capitalist reactionary political systems. 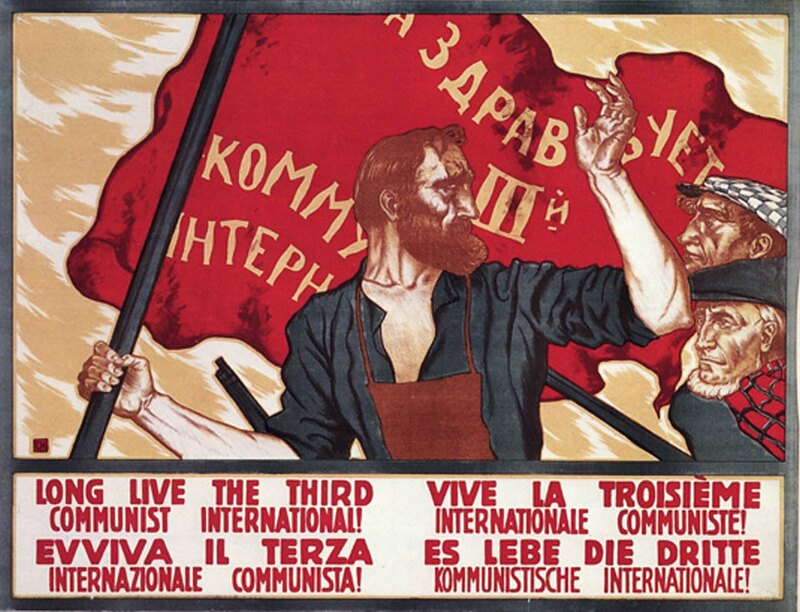 Even though the Second International has collapsed as national socialist parties have sought legitimacy by taking part in the war effort, there remain those dedicated ideologues of worker solidarity who refuse to accept the war or recognize any wartime powers of government. The Independent Labour Party maintains its antiwar policy even though its leading men in parliament do not. Some denounce the national trade unions as sellouts, forming Worker’s Committees in industrial centers where leftist sentiment is strong. The Shop Stewards Movement also emerges from this tumult. By the beginning of April, Britain will have shipped two million shells to France; by the end of the war, the nation will have sent another 185 million artillery rounds. That is one measure of Lloyd George’s success as Minister of Munitions. But he will also become Britain’s last Liberal prime minister, for the Labor Party is emerging out of the trade union movement and will eventually supplant the Liberal Party after the war.